First apology: I’m sorry! I posted two recipes on Tuesday, in a fit of post-scheduling failure, and then topped it off by posting nothing yesterday! I make a lot of soup, and I like a lot of it, but this is a serious contender for being the most universally acclaimed. The kick of the ginger is the perfect counterpoint to the sweetness of the roasted squash, and you can create your ideal soup texture by putting in more or less broth at the end. It’s a staple of my family’s holiday tables, but if you keep roasted butternut squash in your freezer (and you should! ), it’s also a quick weeknight supper option. Beats the heck out of Chinese takeout! Cut the butternut squash in half and scoop out the seeds and strings. Rub the cut sides with canola oil, including inside the hollows. Line a rimmed baking sheet or 9×13 inch pan with aluminum foil (which will make your cleanup life much, much better) and place the squash on it, cut side down. 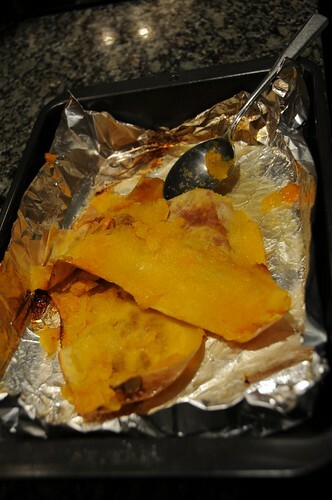 Roast for about 45 minutes, until you can easily poke a toothpick or fork all the way the flesh of the squash. About five minutes before it’s done, peel and chop the onion or the white and lightest green parts of the leeks, and start a stock pot warming over medium heat with a splash of canola oil in the bottom. Saute the onion until it begins to soften. Then add the ginger, and cook until the onion is very soft and the ginger is fragrant, 3-5 minutes. I know it sounds like a lot of ginger, but trust me, you want to add it all now. Ginger added later in the cooking time with have a much stronger bite! Add the squash and about 2 cups of broth. (If you’re using frozen squash, just stick it in at this point; no need to defrost.) 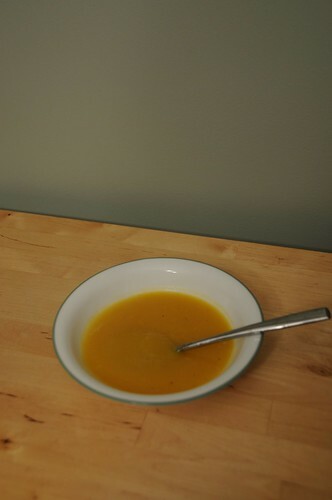 Bring the whole mixture to a simmer and cook for about 15 minutes, using your spoon to break up big chunks of squash. Then stir in the rest of the broth. You can add even more than the recommended four cups if you like your soup thinner; if you like it thick, you might not want to add any additional broth at this point. Puree the soup in a blender or food processor (being careful not to overfill the container with hot liquid!) or with an immersion blender. Salt and pepper to taste. *Two important notes here. First, you can keep fresh ginger in the freezer. It lasts a long time in the fridge too, but this way you never have to worry. Second, you can grate it without peeling. I tried this tonight. Very tasty! Next time I think I’ll go for the 3 T ginger instead of 2.